Why Do We Have To Compete Against One Another ? We have been led to believe that in the business world competition is good and it is necessary to keep the playing field honest. From my experience in the online and offline business world this also is what causes corruption and the need to succeed without regard of the outcome to the many individuals in its path. In the sports industry which has become a multi, multi – billion dollar business, that if you are not a winner your will either be remembered as those who let it get away, a big loser or those who blew their chance to become famous. In the religious world which is just another form of government created to divide the human race. We have pastors, priest, ministers ect.. who are all competing for more church members even though they will tell their members it has nothing to do with numbers. If this is true how many would continue on without any money from their members to support their lifestyles? I believe we are setting up our children for a very disappointing journey as they see that the only way that they can succeed is to compete every step of the way or accept mediocrity and roll over and fall into the ever growing statistic of living in poverty. I will be one of the first to admit I love competing in most sports and even playing games during family times. I used to hate to lose and at times I was a sore loser. I know could care less if I win or lose or if we even keep score. I just enjoy the time we share together. There is a lot of good that could come from a one world community based on if it is not good for the whole community it is not good. Keep it simple eliminate money and you will eliminate what is the main cause for division among the human race. All individuals are equal all products, services, cars, houses, boats ect all have the same value. I highly recommend his e-book it will be the best ten bucks you ever invested you can find it here> UBUNTU Contributionism I do not make any money for promoting his work. There is only one agenda for the human race that I believe has been in place for thousands of years and this is one of conquer and divide which equals slavery. History proves this so if you think you are free then do whatever you want and go wherever you want right now without any money, passport or identification and see how far you get. These are the only conditions you must follow simply called Common Law. 1) Do not kill or harm others 2) Do not steal or take what is not yours 3) Conduct yourself honorably in all that you do and say. I want my legacy to be remembered for helping individuals find the truth in all things by leading by example with love in all things that I do. You may be thinking this title is a little strange. I am in agreement with you for most individuals have heard that The Truth Will Set You Free. I now understand that seeking the truth is a process that will continue on for eons. Whatever you believe to be the truth is what is true to you in this moment of time. My journey on this great planet has been one with many thought provoking experiences. If everything is an issue of the heart and if the words of Solomon are true it is not the heart as we know it. Much research has been done on the pineal gland aka The Third Eye and will continue on to seek out what is its true function. If this tiny gland is what many believe its function to be this could explain a lot of why mankind has not really progressed beyond his hunger for control and savage ways. Could the royals and the so called god`s of ancient civilizations have known that by controlling the pineal gland they could control the masses. By withholding the truth from the common people about spiritual knowledge to learn how connect with the universal divine has enabled these entities to enslaved an entire race. Even the royals have been deceived to think they are free individuals. Many individuals believe that it was sin that caused the fall of man in the beginning. I believe sin was the cause only after mankind aka Adam came to believe that they sinned against their creator. If you wanted to control an entire race of individuals, I believe by creating a way to make them feel shame and guilt would be a good way to get it started. Why do we believe what we believe to be the truth? I believe that fear is used to shape our beliefs and this has been the formula for success implemented in the stories throughout the old and new testaments. As well as the teachings of our governments which controls our educational systems and by the way all the churches. Back to the pineal gland a pea-sized gland in the exact geometric center of the brain and comes from the root word “pinea” which is Latin for “pine cone”. 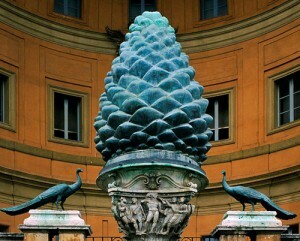 My questions are why does the staff of the pope have a pine cone on the top of it and why is this pictured below located in the Vatican. The Huge statue known as the Pigna (pine) or the Fontana Della Pigna depicts a giant Pine Cone. It is located in St. Peter’s, in an area called the court of the Pigna. I leave you with this to ponder: Those who are deceived don`t know that they have been deceived. Visit here > Seeking The Truth for more info on a movement I have joined started in South Africa that has been working on a solution to break the chains of the money trap. There are many times that the truth will also hurt. As I continue my journey to seek the truth in all things I have come to understand that what may be the truth today is not necessarily going to be the truth five, ten , fifteen or 100 years from now. You may ask how can this be? Here is what Merriam-Webster defines as truth. From the time an individual begins to learn lessons of life taught by parents, relatives teachers, main stream media and the church much of what has been learned is accepted as the truth. Now this is how the system has worked for thousands of years. Why would there be any reasons not believe those who we trust or love. You can call me a conspiracy theory enthusiast, rebel, heretic or all of these and it will not change my passion to seek the truth in all things and help individuals to expand ones thinking to realize what is evolving on this planet is happening for the benefit of the conciseness of the universe. When an individual understands who they really are and most of all that they have been taught the need for the material to satisfy the flesh has been used and will be continued to be used to enslave the soul this is true freedom. Ask your self if money were not an issue would this planet be better off? Would there be millions of our brothers and sister starving and homeless? If you are honest you will see that money is the cause for most of mankind’s problems. Why does the government have so much power so much corruption and still continue to control the masses? It doesn`t seem to matter who is elected. Sure there might be an honest man or women that was elected just to make us feel like we have some hope for positive change. But let`s be realistic they are so out numbered that they will never be heard from on the big scale of major issues. Through the educational system we are taught at an early age the agenda the elite have already planned out for our specific generation. All one has to do is look back at what was evolving during their school years and what was being taught to understand how we have ended up where we are today. The name church was introduced by Constantine who started building them. He also structured the church like the Roman government from the the top down. Do you now see some similarity to the way your church is structured? All these systems require money to function and where do they get the money? It comes from the slaves who have bought into this illusion that we need these systems and money to survive. Systems that have been in place for thousands of years. Ask yourself who created government, religion and money? Then ask why were these created? It doesn`t matter if you believe what I write all that matters is that if you want to find the truth you will have to go searching for it. It is not what you have been taught from any of these systems. ” Accepting something on BLIND Faith will keep that individual BLIND “. By doing so allows others to do your thinking which leads to being programmed. Remember words are very powerful and those who have been and still are in control use them for their specific agenda, even the words you read in the Bible. I am learning that history as we have been told is not true history. I will be revealing at a later time more about how, and why Christianity and The New Testament were created by the Romans. This will be a shock for many and many will not want to accept this or even want to find out for themselves why. True freedom is the freeing of the mind learning how to raise your level of consciousness.